The NOAA ESRL Global CO2 report for January 2018 was released on April 9th. For the first time in 800,000 years we experienced a CO2 concentration over 407.5 ppm, an increase of 2.48 ppm over January 2017. 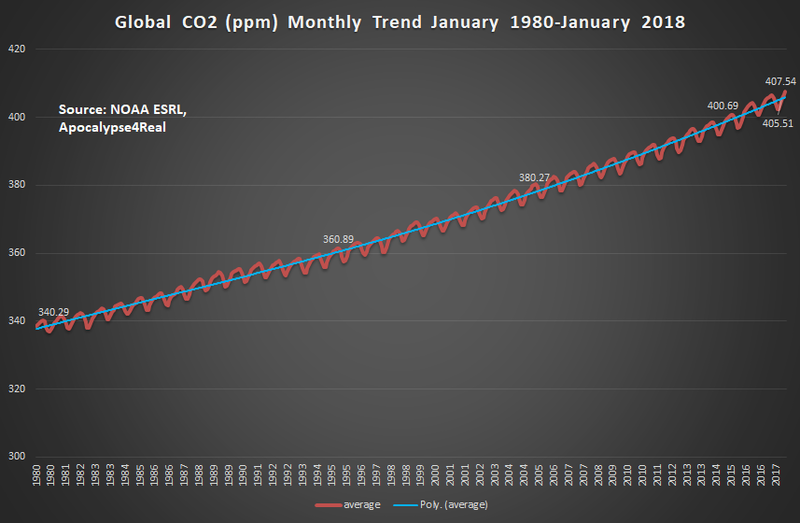 Since January 1980, global CO2 concentrations have increased from 338.45 ppm to 407.54 - an increase of over 69 ppm or 20.41%. However, if one uses a pre-industrial ice core based concentration of 278 ppm, then we are living with an atmospheric concentration average increase of more than 46 percent. We continue to experience an increased rise in the rate of concentration. 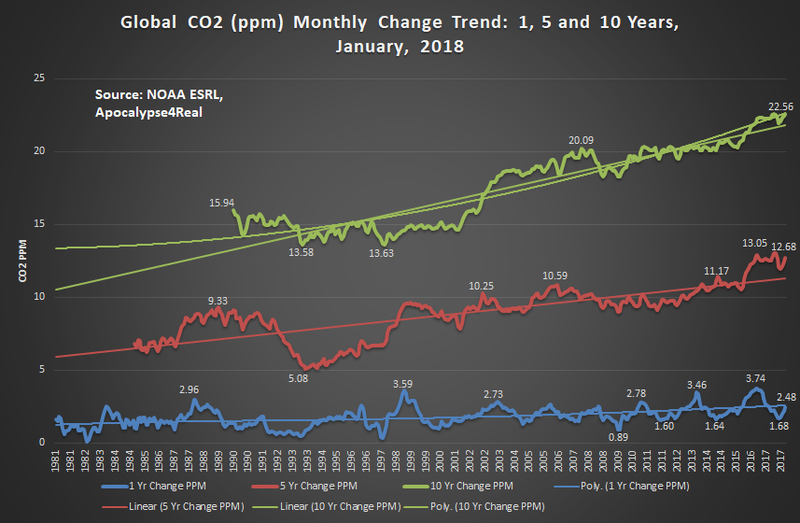 If one considers the five year change in atmospheric CO2, it has increased by 12.68 ppm, a rate which is slowly increasing both during and after La Nina conditions. If one compares the decadal difference, we are 22.56 ppm above January, 2008, and at the highest 10 year rate of increase for any month since January 1980, when NOAA ESRL global CO2 records began. The last year of less than 0.5 ppm increase - 1964. The last year with less than 1.0 ppm increase - 1992. 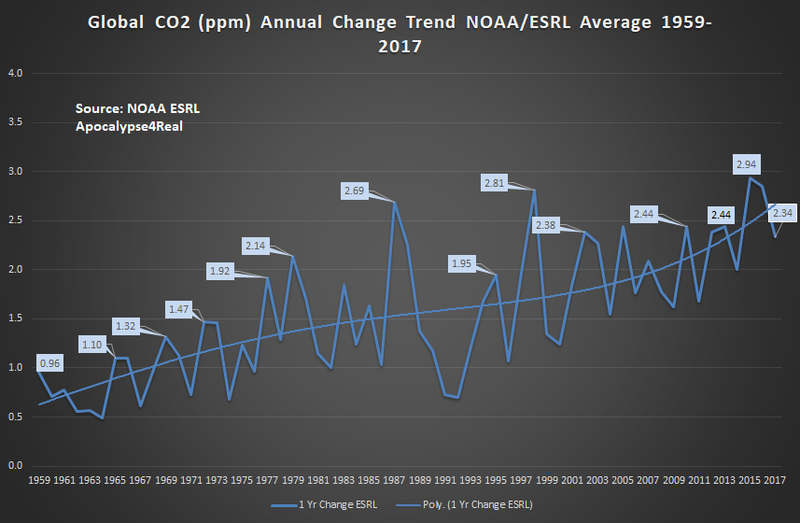 The last year with less than a 1.5 ppm increase - 2000. The last year with less than a 2.0 ppm increase - 2011. The following graphic depicts this by a polynomial trend, what we hope will soon change its slope. Another way to consider this CO2 rise is the acceleration in passing through each 10 ppm change of CO2. 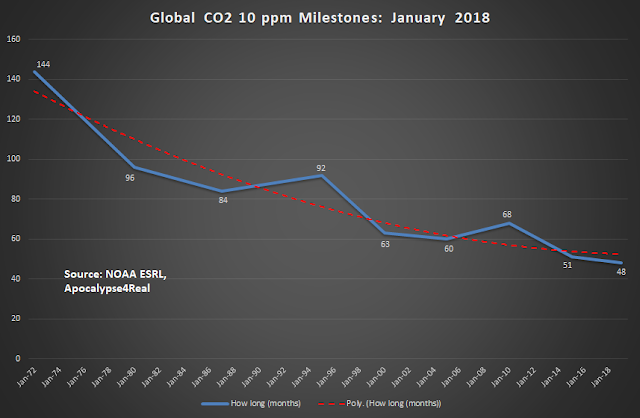 Given the recent trends of CO2 concentration increase, we will likely pass through 410 ppm for a monthly global average in March or April, 2019. That will be only four years since knifing through 400 ppm. What we need to begin to carefully consider, is that humanity not only has to reduce human caused emissions, but also will have to offset the incremental climate feedbacks and loss of carbon sinks that are beginning to enhance the effects of human climate change activity.